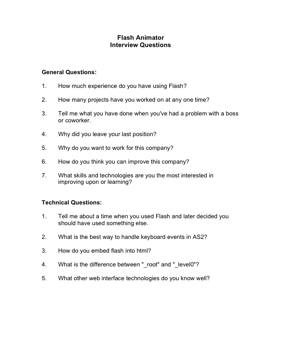 Choose your next Flash Animator with the aid of these helpful interview questions. 1. How much experience do you have using Flash? 1. Tell me about a time when you used Flash and later decided you should have used something else. 2. What is the best way to handle keyboard events in AS2? 3. How do you embed flash into html? 4. What is the difference between "_root" and "_level0"? 5. What other web interface technologies do you know well?